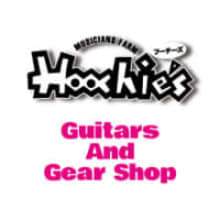 Hoochie's is a professional shop of instruments operated by Crews Corporation. It has all of Crews Maniac Sound products and it is also a showroom-like presence. And it is the first PRS Guitar dealer in Japan. We also deal with imported guitars & basses, as well as high-end domestic guitars. The sales staff are also familiar with the latest equipment and vintage equipment. All products are we are waiting for responsibility after-purchase after-sales support. Dispatch to overseas is also possible. Available payments are VISA / MASTER, PAYPAL. Currently we do not ship rosewood fingerboard guitar overseas.